I had many hours spent ‘down the Rec’ Football, Cricket & Rounders,or on the roundabout, swings or slide. In the early fifties they even held the Carnival on the Rec, I don’t know whether it was Billericay or South Green Carnival. I lived in Beams Way, South Green and well remember playing on what we called ‘The Green’. For many years it was bounded by a hedge which prevented many a cricket and football from causing mayhem to traffic on the main road! Like many at that time, also went to the chapel where Mr.Hewitt ran clubs and activities in what was little more than a large wooden shed with Mr.Butcher. Both of my parents worked in locally, my mother in Balls’ plastics factory and my father at Toolchrome. We used to have regular deliveries of boxes delivered to home containing items from Balls’ which had to have extra bits of plastic, called flashing, removed from them. My first school was in Laindon Road where Mrs. Arthey helped us learn to write on small blackboards with sticks of white chalk. Other teachers I recall were Mr.Doyland and Miss.Powell. From there I went to Billericay Seconday School where Mr.Goldwin was headmaster. I played trumpet in the school orchestra under Mr.Drage, and also recall the names of a number of the other teachers. I broke my left elbow on this slide in 1959, when I was seven years old. I had sneaked out to the shops with older brother, having been told I couldn’t go lol. Hi remember this the equipment was moved to the Langham Crescent Playing field at the time alignment of Grange Road and Southend Road was changed to the present layout. Previously the Grange road was straight and went past Ben Curtis, the Green Grocers. The present car park outside the fish shop used to be the road the building in the photograph would be sited in what is now the road. My sister Hazel Savage broke her leg on this roundabout once it had been re-sited at Langham Crescent. she used to sit on the middle post but on this day she caught her foot and ankle in the vertical spaces between the pivot casing and the central post. If you look carefully you can see a girl sitting on the middle of the roundabout in the photo. I can remember two events at South Green. One time there were Bagpipers marching on the green and the other was to do with the South Green Memorial Hall and that they had just built some raised up buildings at the back of the hall. These were later incorporated into the main bulding either side of the Stage. Yes, it was me on that tricycle! I spent many happy hours on those swings too. Our dog even enjoyed using the slide. When the shelter was demolished I believe the playground equipment was relocated to the field inside Langham Crescent. Oh happy days! Health and Safety would have a fit if it was like this now. No cage at the top of the slide, no cushioned surface and a roundabout with open sides. But I do not remember any bad accidents. If I remember correctly, Billericay Carnival used to finish up on the field by the Archer Hall. 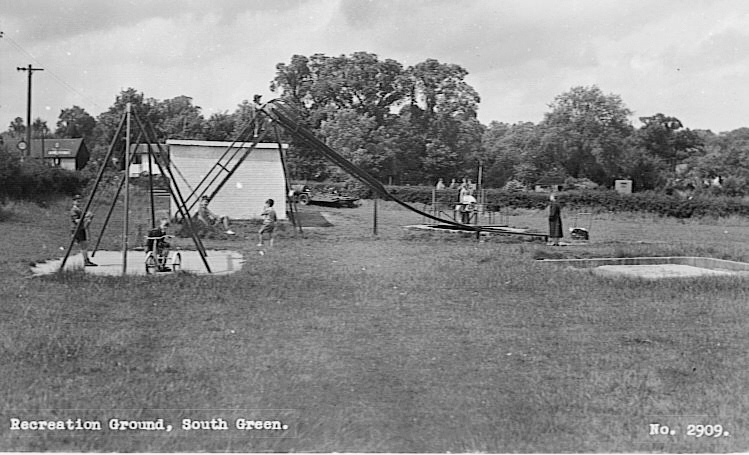 South Green used to have a fete every year to raise funds for a hall. It was always well attended. I think the young boy with his tricycle by the swings is my youngest brother Terry Lockhart.